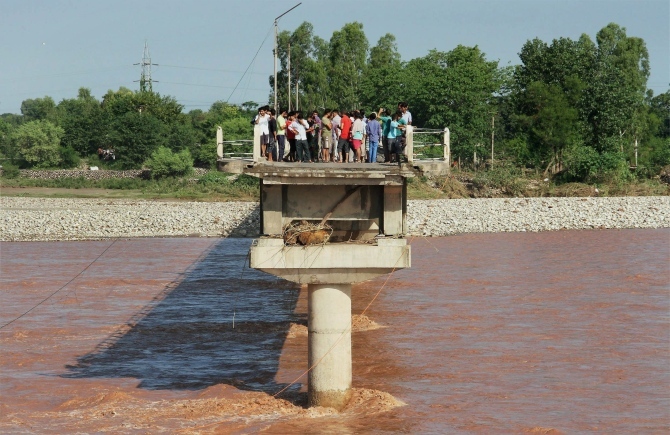 Flood fury on Sunday maintained its grip over Jammu and Kashmir, leaving 138 dead and many marooned as the swirling waters inundated the army cantonment, Civil Secretariat and the high court in Srinagar and snapped road and communication links. 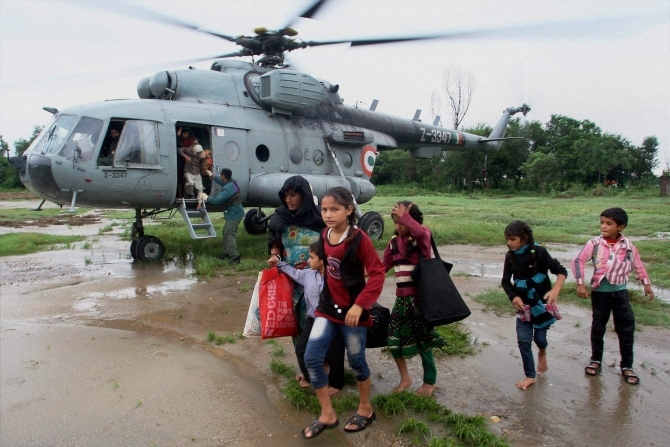 About 12,000 people have been rescued from various areas of Jammu by teams of army and the Indian Air Force till now with 184 columns (75-100 personnel each) of troops and 23 helicopters and planes of Air Force carrying out rescue operations. As the state struggled to deal with the enormity of the situation, Prime Minister Narendra Modi reviewed the flood situation in Jammu region at a high-level meeting attended by Chief Minister Omar Abdullah and top officials. Terming the situation in Kashmir, which is facing the worst floods in the last 50 years, as "grim", Omar appealed to the people not to panic. "I appeal people not to panic and stay above water level, we will definitely reach out to them. It will take an hour. We will reach them and take them out. We are taking all measures to reach out to maximum number of people to rescue them, Omar told mediapersons. "In case of Jammu, the water level is decreasing slowly. We will now focus more on relief and rehabilitation than on rescue efforts. The situation is slowly going back to normalcy in Jammu while in Kashmir the situation has become worse. Especially the situation is still bad in Srinagar. "Our priority is to save people, have talked to cabinet secretary in the morning for boats and rescue teams," he said. During the meeting with the prime minister, Omar sought additional rescue material for the flood-hit and the need to commence air rescue operations in view of the grim situation. Omar said the Cabinet Secretary has assured him that at least 40-50 boats will be sent to Srinagar and they are being brought from Patna, Gandhinagar and Ghaziabad. Along with rescue teams, divers, flood lights and search lights will be sent so that rescue efforts could continue during the night, he said. Divisional Commissioner, Jammu province, Shant Manu told PTI that "As many as 127 people have died so far in flash floods, house collapses and landslides in Jammu region". Apart from Jammu region, 11 people have died in KashmirValley so far taking the total toll to 138. Two people have died in Jammu overnight. In Srinagar, the commercial hub of Lal Chowk and surrounding areas were inundated and the water levels at civil secretariat and high court rose to six to eight feet. River Jhelum was in spate in several places, breaching embankments, which has led to flooding of residential and commercial areas. People are stuck in their houses and air force choppers have been pressed into service carry out rescue operations. Officials said vital roads including the airport road, Exhibition Crossing, Hari Singh High Street, Lal Chowk and Regal Chowk have been submerged under several feet of water. 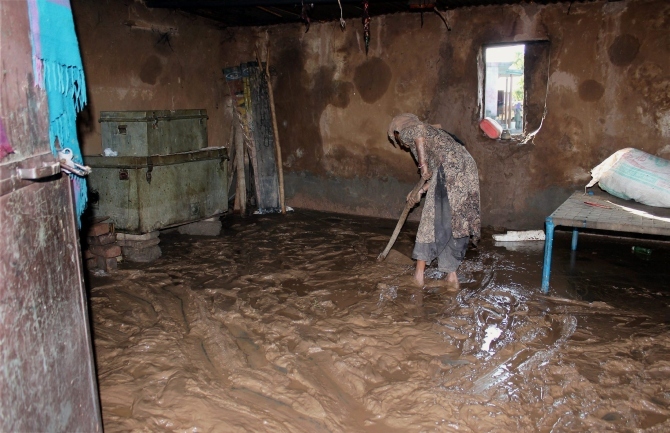 Access to main hospitals such as SMHS and Lalla Ded has been cut off due to flooding of roads. Thousands of people from water-logged areas have been moved to safer places but many people have been trapped in upper stories of their homes in low-lying areas of the city, the officials said. Communication system has been disrupted with all almost all private cellular networks out of order. The landline telephone network has also been badly affected. Electricity and water supply has remained disrupted in affected areas for the past six days now. 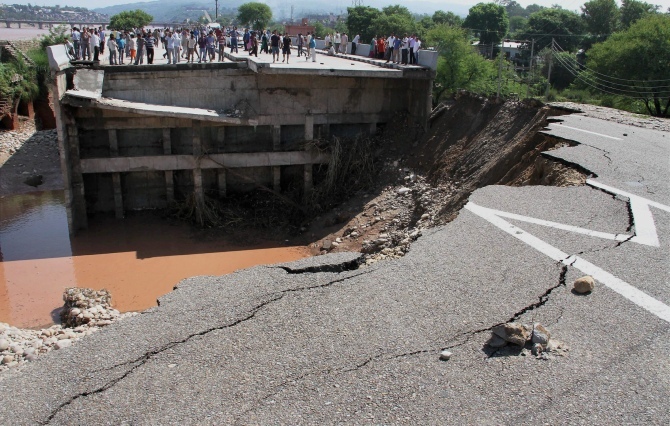 Twenty-two people died overnight in Jammu including five in Jammu due to house collapse, six in Udhampur, five in Reasi two each in Rajouri and Poonch taking the toll in Jammu region to 127. Of the 63 people who were washed along with a bus in Rajouri district on Thursday last, two more bodies were recovered on Sunday, taking the total number of bodies recovered to 37. PRO Defence, Col S D Goswami said that 3,000 people were provided medicines, 2,000 people provided shelter and 3,500 people provided food by the army in various places in J&K. 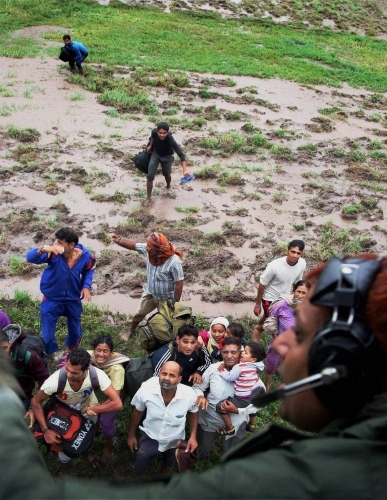 Reaching out to jawans in marooned BoPs and fencing areas along Indo-Pak border, IAF choppers evacuated 108 jawans of BSF and Army from BoPs and forward posts today. "Operation Megh Rahat in Jammu and Operation Sahayata launched by army in Jammu and Kashmir regions has moved on to next phase where Army plans extensive deployment in support of flood relief," Col Goswami said. The use of helicopters, special divers, heavy engineering machinery and more boot on ground will be the focus of the army to assist the locals in critical situations, that may arise due to heavy rains that are lashing the region, he said. A senior official said that additional teams of National Disaster Response Force and 100 boats have been rushed to Kashmir for launching rescue operations in the Valley. "We are facing shortage of boats for rescuing people from inundated areas. A lot of 100 boats is being airlifted from Delhi which shall be landing here any moment," Divisionaln Commissioner, Kashmir, Rohit Kansal said. The decision on the Prime Minister's visit came following a review meeting which he called after being briefed on Saturday by Home Minister Rajnath Singh who returned to the national capital after surveying the flood-affected regions, the Prime Minister's Office had said in a statement. Modi also announced a special assistance of Rs 1,000 crore to flood-affected Jammu and Kashmir.